Silicon is never used as a metal in cosmetic products, but always in the form of derivatives combining different types of elements, of which oxygen is the most frequent. In this series of contributions, we will look at the uses of these derivatives during the formulation process. There will mainly be two chapters: one dealing with silicas and silicates, another then dealing with clays and colloidal suspensions. In a series of complementary contributions, we will examine inorganic silicon derivatives such as silicones, then organic silicon derivatives or solgels. The silica is the natural form of silicon dioxide of the chemical formula SiO₂qui is used in the composition of many minerals. It exists in the free state in different crystalline or amorphous forms, and in the combined state in silicates, the groups SiO₂ being then bound to other atoms (Al : Aluminium, Fe : Iron, Mg : Magnesium, Ca : Calcium, Na : Sodium, K : Potassium…). Free silica is very abundant in nature, in various forms. However, the silica qualities used in cosmetic formulations are almost all of synthetic origin. Synthetic silicas are made of high purity silicon dioxide. They come in the form of a white powder and their properties depend on how they are manufactured. A distinction is generally made between wet processes for obtaining precipitated silica, gel and silica sol, and thermal processes for obtaining pyrogenic silica, arc silica and microsilica. In practice, there are several types of silica for cosmetic use: pyrogenic silicas and precipitated silicas. They are produced by a combustion process, which leads to spherical particles of nanometric size. They are formed by pyrolysis from SiCl₄ to 1000° C.
These particles with a very large specific surface area have the property of thickening systems that are both aqueous but mainly oily. The surface of this silica is characterized by the presence of silanol groups that form a network of aggregates by hydrogen bonding with the medium, which visually results in thickening of the solvent. The most common qualities are known as Aérosil™. The most common INCI names are : Silica, Fumed silica, Silica dimethyl silylate, Silica silylate. Pyrogenic silicas are used for several purposes in the cosmetic industry: - flow agent for powders - increased temperature stability of lipsticks, - gelation of anhydrous oils and systems. In some cases, pyrogenic silicas may generate thixotropy. Some qualities are basic components of Pickering emulsions. In the case of Pickering emulsions, stability is ensured by the presence of solid particles strongly anchored at the interface between water and oil. The emulsions obtained are more stable than their counterparts stabilized by molecules surfactants, and possess a greater interfacial elasticity. They represent 80% of the world production of synthetic amorphous silicas. Characterized by high porosity, they are obtained by the action of an acid (mainly H2SO4, but also HCl, CO2…) on a sodium silicate solution. Precipitated silicas are mainly used because of their absorption quality to fix particular substances such as perfumes. They may also allow touch adjustment in some fat formulation systems. Finally, they modify the feel of powders and powder systems. A silicate is a salt derived from silica (SiO₂). Silicates are minerals whose skeleton is essentially formed by silicon and oxygen tetrahedra (SiO₄), added aluminium, magnesium, iron, calcium, potassium, sodium and other elements. There are many families: - ferromagnesium silicates: chlorites, serpentines, amphiboles, pyroxenes, peridots or olivines, garnets ; - aluminosilicates, for which aluminium can replace silicon : feldspar, rich in silica, zeolites, micas ; - alumina silicates: tourmaline, garnets. Silicates are widely used in the cosmetic industries for different types of applications, and more particularly in formulations. There are actually two types: amorphous silicates and functional silicates. Each of these specific qualities is used according to the needs of the formulator. They are used for different reasons in cosmetic formulations. - Amorphous silicates Talc, mica or fluorphlogopites are used as powder fillers for the formulation of various products such as make-up powders or foundations. In this category, silicates of different particle sizes are mainly found. Their function is then to help define the coverage or opacity level of the film formed. They also determine the touchability of these preparations. The criteria to be taken into consideration are mainly particle size and particle size distribution. In addition, the large specific surface area makes them absorbent fillers in certain applications such as dry shampoos, products absorbing excess sebum or similar applications. 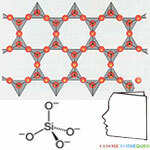 - Silicates with functional properties These substances can be used for quite specific reasons. These are mainly clays. The most sought-after property in this case is very often a gelling power. We therefore find in this family the different types of clays, hydrophilic or organophilic. In these uses, particular attention is paid to the formation of gels, whether viscosity adjustment or colloidal suspensions to counter, for example, the sedimentation of pigment dispersions. In this case, it is the swelling properties that interest us. Depending on the nature and origin of the clays, the characteristics of the gels obtained can be significantly different. Finally, in organic anhydrous environments for which we do not use water, certain varieties of so-called organophilic clays are used to obtain these effects. Another use mainly concerns the complexation and/or cation exchange capacity of these clays, which can neutralize certain undesirable effects. This is one of the uses of kaolin. The uses of these derivatives will be dealt with in a separate contribution. Silicates make up 97% of the earth's crust (telluric origin). The sources are therefore extremely abundant. They are mainly natural ingredients and/or used as a basis for structural modifications. However, there are some synthetic varieties. All substances from quarry materials such as talc, kaolin, mica, sericite (variety of mica), etc. are found in this class of ingredients. These substances are complex silicates, which differ significantly depending on the source. The chemical composition is fairly stable: - talc : Mg₃[(OH)₂Si₄O₁₀], - muscovite : KAl₂[(OH)₂AlSi₃O₁₀] (a mica), - kaolin : Al₄[(OH)₈Si₄O₁₀] (a clay). On the other hand, organoleptic properties can be significantly different: size and shape of elementary particles, colour, presence of natural contaminants. This leads to different"cosmetic" properties, such as coverage or the ability to form more or less transparent or opaque films, colour and gloss. The choice between the different varieties is made according to certain criteria but mainly according to the type of make-up sought: more or less covering, more or less white, more or less matt, etc.. Talc is a mineral species composed of doubly hydroxylated magnesium silicate of formula Mg₃Si₄O₁₀(OH)₂. Georgius Agricola described this mineral in 1546, but it has been known since ancient times. Its name comes from Persian: /Talq/ طلق . Borrowed from Arabic talq the word would have been introduced by Bernard Palissy in 1560. There are two polytypes of talc, talc 1A and talc 2M. This corresponds to different types of crystallizations. This has little or no effect on the properties that interest us. Talc results from the alteration of magnesium silicates such as pyroxenes, amphiboles, olivine and other similar minerals. It is commonly found in metamorphic rocks, often of an alkaline type due to alteration of silicates. In France, the talc quarry at Trimouns, near Luzenac in Ariège, is the largest in the world (400,000 tonnes extracted per year). There are also some in Canada: two mines in Ontario and one in Quebec. Canada produces about 80,000 tonnes per year. The most common particle sizes in formulation are from 5 to 40 μ.
Muscovite or Micas Mica is the name of a family of minerals, the silicates group and phyllosilicates subgroup, consisting mainly of aluminum and potassium silicate. Along with quartz and feldspar, it is one of the constituents of granite. The word mica comes from Latin micare meaning shine or glitter. Another etymology proposes"crumb" because this rock is friable. It is a quarry material like talc, extracted from different deposits. Depending on the origin, the chemical composition may be slightly different. It is characterised by its laminated structure, most often giving shape to flakes of varying size depending on the grinding treatments applied to it. Its luster is metallic enough. The properties of micas in formulation are mainly based on their transparency. Therefore, they are an alternative formulation to talc, thus modulating the transparency and white effect of the products obtained. The main varieties will be chosen according to their grain size and whiteness level. This aspect depends largely on the contaminants naturally present in the original rock. Synthetic qualities will be chosen whenever the whiteness level of the products obtained is a critical element in the specifications. In this class is synthetic mica, or Fluorphlogopite. Not presenting the impurities of natural mica, it develops very white, very"clean", very transparent, very glittering effects, with more intense and higher interference effects. The name derives from the Greek phlogopos which means"flame-like", alluding to the color of some specimens. In this case, it is a fluorine-rich derivative: fluorine-hydroxyl-phlogopite. There are also different qualities depending on their grain size. Its name INCI is SYNTHETIC FLUORPHLOGOPITE. Several types of use of these mineral derivatives can be distinguished. - Probably the most important is the one that sees them as basic elements in the formulation of products in powder form: make-up powder, pressed powder, pressed eye shadows, etc.. In this case, they are chosen according to the organoleptic characteristics of each individual. The main properties will be coverage, colour, grain size and feel. - These substances are also used as a filler supplement(1) in the formulation of liquid and emulsion foundations. In this case, they allow the coverage and matting characteristics to be adjusted within the same range to obtain comparable results. - A rather frequent use consists in using them as diluent of pigments in the manufacturing phases. Indeed, the use of pure pigments is made very delicate because of their difficulty to be dispersed. The use of a neutral diluent (extender in English) such as talc or mica makes it possible to prepare primary pigment dispersions much easier to process and to measure. In these operations, the pigment is finely dispersed and milled in the selected diluent. - In some applications, they act as an absorbent to adjust textures, or as a matting agent to correct certain visual effects. - Mica is one of the bases for the formulation of the category of products claiming to be'mineral make-up'. Although this positioning is not based on any technical specificity, it nevertheless constitutes a typology of products within this family. - Finally, certain varieties have been developed to present a particular aptitude for compaction techniques, with the aim of producing pressed powders or compact make-up. This is the case, for example, of a recent development by the Imerys group (ex-Talc de Luzenac) with Imercare Sheer Silk™, a specific magnesium silicate with very good transparency and compressibility properties making it perfectly suited to compaction applications. 1. 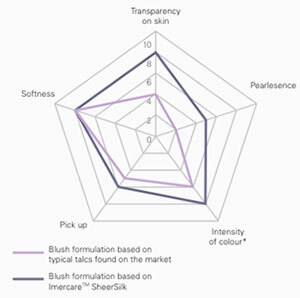 See : Cosmetic product design: Formulation - Anne-Marie Penssé L'Héritier 380-381 - Lavoisier 2014. Thanks to Elémentis and Imerys for the information. A biologist by training, Jean Claude Le Joliff was a man of R&D for many years. Successively in charge of R&D, then of Research and Innovation in a large French group of cosmetics and luxury goods, and after an experience of setting up a research centre (CERIES), he turned to innovation management. He has also been Associate Professor at the University of Versailles Saint Quentin (UVSQ) and remains a lecturer in several specialized courses: ISIPCA, IPIL, ITECH, UBS, UCO, SFC, etc. Consultant to several international companies, he has actively participated in projects such as Filorga, Aïny, Fareva, and many others. He created the Cosmétothèque®, the industry's first conservatory of crafts and know-how. Polymers based on the silicon atom in combination with oxygen, silicones find their origin in the work of Berzelius who isolated this element in 1824. Successive developments then led to the marketing of the first products in the 1940s by Dow Corning. May 16, 2018 Cosmetic innovation: repair and rejuvenation of the JDE by a polypeptide,"Cebeline". Oct. 24, 2017 The myth of blue skin: the return?